The following startups have been chosen and compiled in random order by writers Josh Constine, Anthony Ha, Colleen Taylor, and Kim-Mai Cutler among 75 projects pitched during Y Combinator’s 15th Demo Day. Why? It’s ridiculous that our clothes don’t fit. 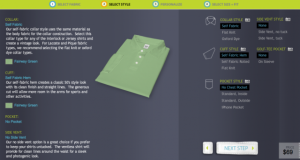 Vastrm has a very simple goal: to get you the perfect fitting shirt. Founder Jonathan Tang (who, it should be mentioned, can convincingly rock a pair of pink pants while giving an investor presentation) has quite the pedigree: His family has been in the fabric business for years, and he says they now make one out of every six t-shirts worn in the U.S. today. According to Tang, the holy grail of the garment industry is getting the right fit. Why? Let Apple build your cyborg’s brain. “Forget everything you know about telepresence robots.” Double Robotics has created a machine called The Double, which is essentially a drivable robot stand for an iPad — you just install an iPad app to start teleconferencing. With this approach, Double Robotics can offer a much more affordable telepresence robots, charging $1,999 per Double. Beta testers included companies like Johnson & Johnson and Coca Cola. The first shipment of The Double should go out later this year, though the website says that first batch is already sold out. Double Robotics says it has already seen more than $500,000 in preorders, with orders coming from seven Fortune 500 companies. Why? It’s a jungle of APIs out there. This startup makes it easy for businesses to automate common tasks on the web and sync data between different web apps. It recently announced the launch of its third-party developer platform. The company says the mass migration toward cloud-based services and a wealth of new web APIs have made it harder for services to connect with other applications. Zapier says its service acts as a hub and spoke for all of these different pieces. Why? Because everyone can’t be a Silicon Valley insider. More than 90% of startup value creation happens within private markets which means lots of investors have been sidelined. Serious investors, especially those outside of Silicon Valley, can lack access to startups they believe in. So FundersClub has created a private marketplace where accredited investors with as little as $1,000 can fund private companies and startups, all through an online platform. 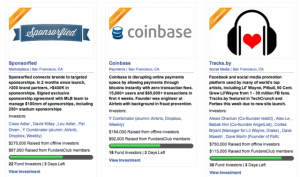 LendingClub and Kickstarter have shown it’s possible to pool capital in support of innovation. FundersClub has found traction too, raising over $520,000 for itself when it initially aimed for $250,000, and seeing $1.3 million flood in through the system in less than a month since launch. FundersClub could augment the best VCs and angels by giving founders access to crowd dollars that will let them fill out their rounds without adding noisy big-name investors who might not add value beyond their money. Why? Watch your product evolve as fast as you can code. Light Table creator Chris Granger says developers are currently working “in the dark, like being a painter with a blindfold on.” That’s why Granger is building a new software development environment with features like easily accessible documentation, instant feedback, and a drafting table-inspired visual design. He raised $316,000 from more than 7,000 backers on Kickstarter and has just launched an initial version of the Light Table playground. Why? They’re the right party-hardy team for the job. A majority of the very largest companies have sponsored trade shows or conferences. Microsoft, for example, spent $30 million on conference sponsorships this year while Pepsico spent more. Sponsorfied says the problem is this market is stuck in the 1990s. It’s fragmented, offline and extremely hard to manage. Sponsorfied says it will centralize the market onto its network for sponsors and do for sponsorship what Google did for advertising. They’ve already done 200 deals with $400,000 in sponsorships and are working with brands like PBR, Popchips, and Red Bull. Two weeks ago, they signed an exclusive deal with a major sports team that sells over $100 million in sponsorships every year. Why? Rampant cloud storage fragmentation. Filepicker says that web and mobile apps can only work with content on users’ hard drives and can’t access web-based files. Say, if a user wants to edit a photo on Facebook, it has to go back and forth with other applications. But if Facebook and a web app could speak to each other directly, it could be easier. Filepicker provides a single uniform API for developers, so that when they want to upload a file, they can pull them all directly from Facebook, Google Drive, Instagram, Box, and all the other places they have content stored online by just implementing a simple line of code. The startup says that developers love it, because it makes their applications better. The company has seen 20 percent week-over-week growth for last 12 weeks. The platform has 134 apps total, including Scribd, SurveyMonkey and Alfresco, and will be profitable next month. Why? It will make next-day and same-day shipping work. BufferBox is building a network of big green lock boxes scattered across cities and transportation networks like train lines where you can get packages securely delivered. That means you don’t have to sit at home weighting for your shipments, and shipping companies don’t waste money on multiple delivery attempt or end of with dissatisfied customers. 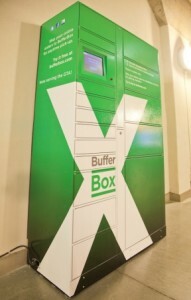 BufferBox is based out of Waterloo so its first rolling out in Toronto’s Union Station. It plans to have BufferBoxes in 100 locations by the end of the year. Today the startup announced that Google has signed up, in addition to Walmart, to allow ecommerce customers to give packages delivered to the boxes. Why? They’re on the same trajectory as Airbnb, and we’re moving from a material to an experience culture. Vayable offers travelers the opportunity to buy experiences in locations around the world — it’s sort of like an Airbnb for experiences. How unique are these experiences? One of the early ones sold on the site was a fishing trip with a Fijian king. The founders say that “artists, bloggers, kings and mayors and even a homeless man in Tenderloin” have started building small businesses on the site. And it’s already profitable. Why? That’s a hell of a lot of users. 9gag aggregates memes and jokes from around the web — much like Reddit, but with a pure focus on funny stuff (gags, get it?) The site is already crazy popular: Its founders say that in July, 9gag had more than 65 million unique visitors, compared to Reddit’s 39.7 million (that second figure was provided by 9gag, so grain of salt, etc.) Its other metrics are similarly jaw-dropping: 3.8 million fans on Facebook, 920,000 followers on Twitter, and users on average spend more than 17 minutes on the site during each visit. The company launched its first mobile app three weeks ago, and it already has 750,000 downloads. User-generated content is always a hit-and-miss game, but the 9gag people say that on the whole, the site can churn out a lot of great stuff because of the immediacy of the Internet. “No studio in LA can be as timely… with creating this kind of funny content,” one of 9gag’s founders said in the company’s demo.